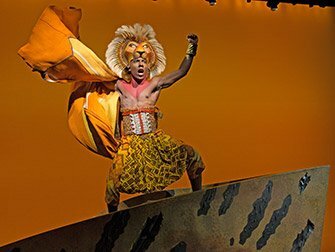 Save on your Lion King on Broadway tickets by buying them before you go to New York. Buying theatre tickets online is easy and safe, above all it saves time and money! The Lion King is performed in the Minskoff Theatre which is the place to be if you want to be transported to the magical world of the African animal kingdom. Watch as the life-size animal figures come to life in the opening song “Circle of Life” and marvel at the very best of Broadway theatre. Throughout the show there will be plenty of time to enjoy the beautiful scenery and genuineness of puppetry. You might even get to see some of the animals up close and personal as they like to wander around .. This Tony Award winning musical is largely based on the eponymous Disney movie that is known and loved by many. It tells the Hamlet-like tale of the lion cub Simba, prince of the African lions and heir to the throne. Simba “Just Can’t Wait to be King” and hopes he’ll be a brave king like his father. But after his father is murdered by his evil uncle Scar, Simba is forced into exile believing that he is to blame for his death. In exile he meets Timon the meerkat and Pumbaa the warthog and they teach him their philosophy of life, “Hakuna Matata” (“No Worries”) as he grows up. In the forest he realises that he must reclaim the throne to save the lions and take his rightful place as “King of Pride Rock”. In order to do so, he must defeat Scar. The thing that sets this musical apart is the costume design and scenery, which is truly impressive. The animals of the African Savannah are really brought to life: lions, antelope, hyenas, wildebeests, giraffes and many more right in front of your eyes. Coupled with Oscar-winning songs like “Can You Feel the Love Tonight” the musical fulfils its promise of sheer entertainment. Julie Taymor played a crucial role in the development of the musical working on additional music and lyrics, costumes, mask and puppet design as well as being the director. Her work helped define the Broadway blockbuster. 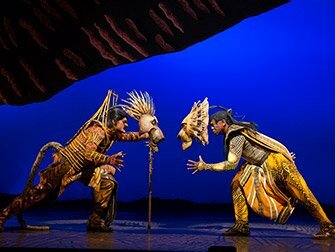 How to buy the Lion King on Broadway Tickets? It is easy to buy tickets for the Lion King with the link below. I recommend buying tickets online before your trip to New York. Why? The website below guarantees great seating in Orchestra or Front Mezzanine for discounted prices. You will save time and money and most importantly you don’t have to stress about finding tickets when you are in New York. A lot of Broadway musicals are very popular and are often sold out. Eric’s Tip: This musical is great for the entire family. If you have children then you’ll certainly know the story of The Lion King and if not you can enjoy the songs, dances and costumes of the show. There isn’t anything like it on Broadway. If you order your tickets below, you’ll have great seating in either Orchestra or Front Mezzanine, which I think is the best way to truly experience the magnitude of the show. Don’t want to see the Lion King?